Mobile vs Responsive: What’s the Difference? One of the biggest transformations in recent web history is mobile vs responsive websites. What’s the difference and how do they help your business? We’re here to answer that question. We will run through what categorizes a website as mobile and, on the flip side, what features make it responsive. Responsive design is an approach to web design that optimizes the viewing experience by automatically resizing the site to fit a wide range of different devices. It is a concept that was introduced years ago and took off in 2012 when it was listed #2 in Top Web Design Trends Internet usage on tablets and mobile devices; last year was the first year smartphones became more widely used for surfing the web than desktop and laptop computers. While turning websites into responsive sites is something businesses need to do to keep up with customer preferences, many have failed to adopt the practice, overlooking its importance. A 2014 research study done by Guy Pod tested 10,000 websites for responsive indicators. Results showed that only 12 percent of these sites were responsive. Why are responsive websites so important? On top of meeting the changing needs of consumer behavior trends, companies also depend on responsivity to rank higher on Google’s algorithm. In March of 2015, Google made an announcement that they would be “expanding our use of mobile-friendliness as a ranking signal.” Effective April 21, 2015, this change would “affect mobile searches in all languages worldwide and would have a significant impact in search results.” This mobile apocalypse hinted that Google would start rewarding those websites that were optimized for mobile with better SEO. Websites that are not mobile-friendly might see a negative impact on search engine rankings. Responsive design is an approach to web design that aims at providing an optimal viewing experience. It ensures ease of readability and navigation by resizing content to fit the screen of a wide range of devices. A responsive website adapts to the viewer’s screen by using flexible images, fluid grids, and media queries. Flexible images are sized in relative units, such as percentages, so that they always display within the containing element. Fluid grids are proportion-based grids that also size page elements in relative sizes. Media queries allow pages to use different CSS rules based on the width of the browser. 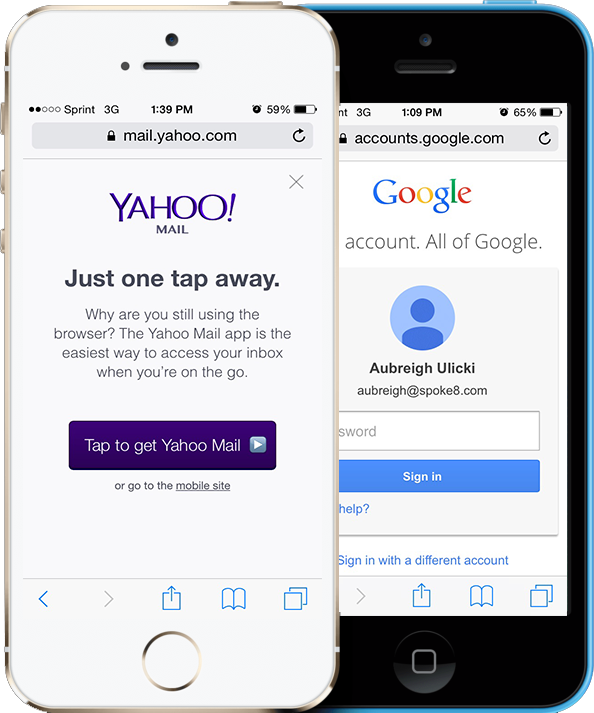 Mobile websites, on the other hand, are miniature websites. They are designed to work in the same way across whatever device the viewer is using. Therefore, nothing changes between a tablet and mobile device. Traditional mobile websites will have an “m.” in front of the URL; this is because mobile sites are built completely separate from traditional websites. For instance, try logging onto your Gmail account on your mobile device. You are prompted to “view the mobile site.” If you are given an option to switch, the traditional site and the mobile site are completely different frameworks. The viewing area on mobile devices is much smaller than that of other devices, making navigation limited. In order to decrease the time it takes for the page to load on a mobile device, mobile sites may use fewer images and graphics. Still not sure what we’re talking about? Take a look at these company websites on your desktop or laptop computer, then switch over to your mobile device: Gmail, Yahoo! Mail, Shutterfly, Google Maps, BuzzFeed, and The Huffington Post. Responsive design is optimized for everything: desktops, laptops, tablets and mobile. Mobile websites are built independently from a company’s web page; the website and the mobile site are separate frameworks. With today’s technology, a responsive website design addresses most of the reasons why people used to build independent mobile websites.